This is a super fast and easy dinner recipe. The teriyaki salmon is from the January, 2016 issue of Bon Appetit magazine. I love it for it’s simplicity and the fact that there is no added sugar. Sake and mirin give the sauce sweetness, and the saltiness comes from the soy sauce. Feel free to use low sodium soy sauce, since the teriyaki sauce is reduced in the pan, concentrating its flavors. I like to serve the salmon with asparagus that has been seasoned with a bit of lemon zest, lemon juice, and olive oil. Adding rice rounds out the meal. 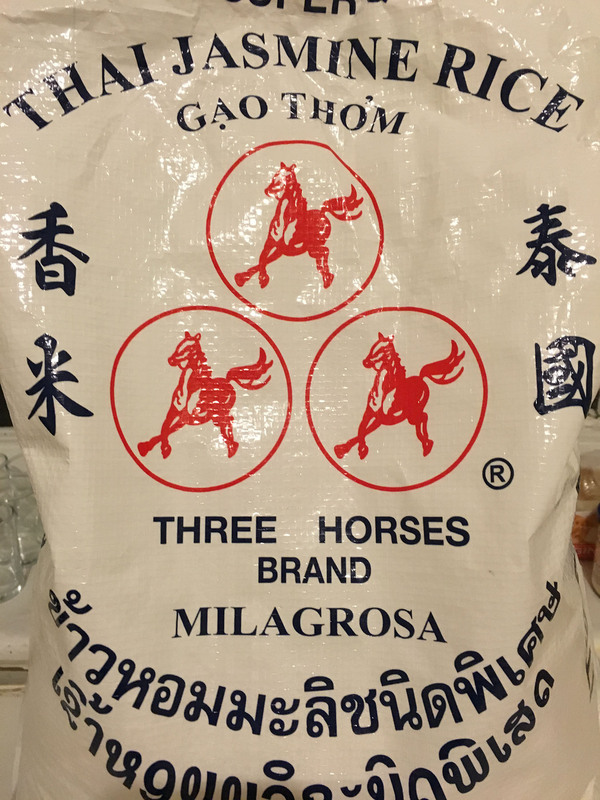 Although it is not traditional, I like to serve this with Thai jasmine rice, but any plain white rice will do. When cooking the salmon, I like to get the pan very hot before adding the salmon, skin side down. This will prevent the salmon from sticking to the pan. In addition, it is nice to cover the pan with a mesh splatter screen, which will help to keep the oil from splattering all over the stove while you are pan-frying the salmon. I used a simple junmai-style sake that I found at the grocery store that is made by Hakutsuru. In a small bowl, combine sake, mirin, and soy sauce and set aside. Heat vegetable oil in a 10-inch skillet over medium-high heat. When oil is very hot, add salmon, skin-side down, to skillet. Cook until skin is crisp, about 4 minutes. Turn fish and cook for 2 minutes. 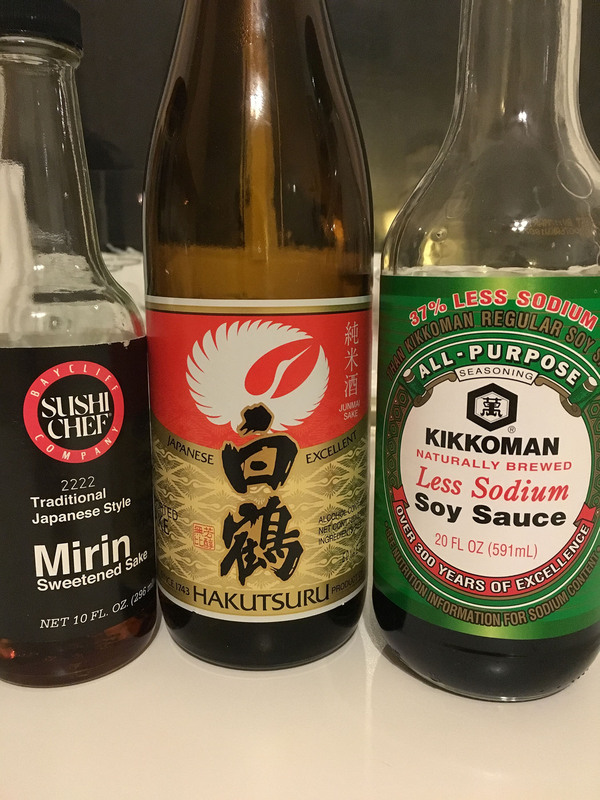 Bring sake, mirin, and soy sauce mixture to a boil in skillet over medium heat. Cook until it is reduced by about two-thirds, about 4 minutes. Add salmon, skin side up, and spoon sauce over salmon for about 2 minutes, until sauce is syrupy and salmon is just cooked through. Place a steamer basket inside a medium-sized pot filled with approximately 1 inch of water. Bring water to a boil and add asparagus to steamer basket. 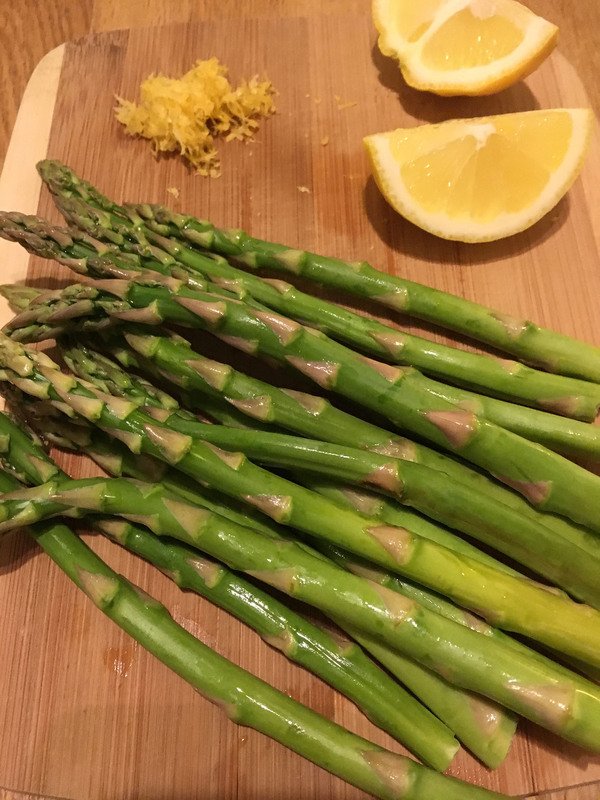 Remove asparagus to a plate and toss with olive oil, lemon zest, and a squeeze of juice from one of the lemon quarters. Season with salt and pepper to taste. 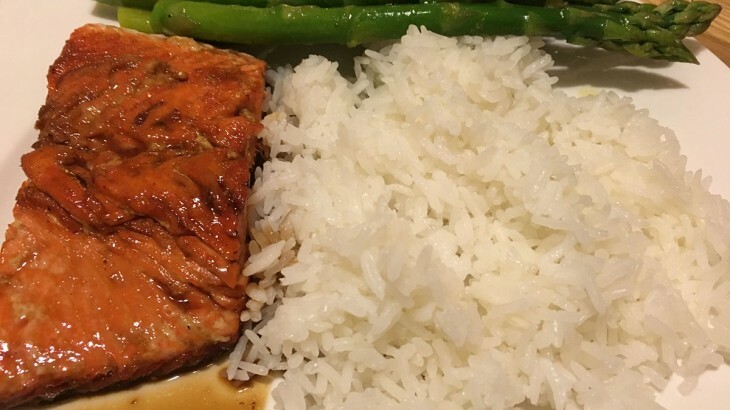 Serve asparagus and salmon over steamed jasmine rice.